Citizens of the country can help arrest the disease and make the country Ebola FREE by helping to contain the disease through education and adopting the best health practices. 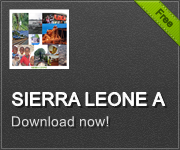 Download the Sierra Leone App at www.saloneapp.com or at the Google Play and Amazon App store and Visit the Health Link within the App to educate yourself about Ebola. Eradicating the disease and curing those with it is more important than pointing fingers and casting blame; So #beresponsible, #stayresponsible, #eradicateebola, #stoptheignorance, #kickebolaoutofsalone.